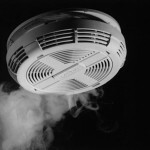 We can fit top quality, sealed unit smoke and carbon monoxide alarms in your property for a fixed fee of only £35 + VAT. We recommend FireAngel/Kidde products which have a sealed in Lithium battery lasting for the life of the product (7-10 years), meaning tenants cannot remove batteries. We’ll speak to agents or tenants if required, to arrange access. Smoke alarms fitted to ceilings on every habitable floor. You advise us how many smoke alarms you require. Fixed fitting fee to get your property legal. Alarms should be checked to be in working order at the start of every tenancy and this is why we recommend and supply the FireAngel/Kidde products with long lasting batteries. Cheaper alarms are available but are prone to tamper and short battery life. Tenants are unlikely to change the batteries in alarms meaning your property, and your tenants, are at risk.